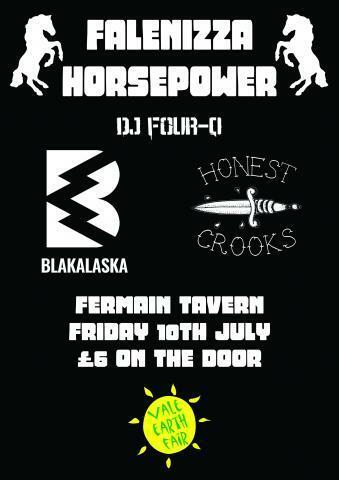 The Vale Earth Fair is bringing Falenizza Horsepower over from Jersey for a fundraiser at the Fermain Tavern next Friday (10 July) for a double header with Blakalaska who will be playing their first gig since the launch of their new EP ‘Machine’ earlier this year. Honest Crooks and DJ Four Q complete the bill. Doors open at 8pm – over 18’s only. £6 entry on the door. Falenizza Horsepower are a two piece of drums and bass who are celebrating ten years as a band this year, so the perfect time to bring them back to Guernsey. Attempts to describe their music doesn’t really do it justice. Composed of frenetic drumming and thick slabs of bass, and layered with all sorts of bits and bobs, they create a powerful mesmeric sound that captivates their audience. Evolving from Bright Lights who finished the 2013 Vale Earth Fair main stage off in style, Blakalaska’s fresh, unique and uncharted sound fuses elements of rock, pop, dubstep, dance, trip hop and drum ‘n’ bass. The backbone of the band’s sound comes from Oliver McVey’s clinical electronics underpinned by Joe Langlois’ tectonic bass lines and Barney’s mastery of electronic drums to give the songs a deep hypnotic groove. Fronting the band, Lee Rosete cooly holds command with her dynamic, silky vocal hooks soaring and gliding over the heavy bass-driven rhythms, while the band’s sound is completed by Oliver Farrimond’s shimmering anthemic guitar licks. With their critically acclaimed first release out earlier this year, their high-energy electrifying live set is receiving rave reviews, and Blakalaska are a band to watch out for. The final band on the bill for this Vale Earth Fair fundraiser are new three piece the Honest Crooks. With their first live performance only a couple of months ago, they are quickly building a reputation on the local live scene as something a bit special. Playfully arranged covers mixed with well constructed originals, they confidently blend reggae, ska and punk rhythms to great effect. This year’s Vale Earth Fair is on Sunday 30th August, with New York’s Jungle Brothers headlining. Advance tickets are now on sale from HS2, YakWax, Manzurs, Kendalls, Sails, & Bluchip, or through www.valeearthfair.org at £15 (£10 concessions), or you can pay £20 at the gate on the day (£15 concessions). Children (under 12) are free if accompanied by an adult.